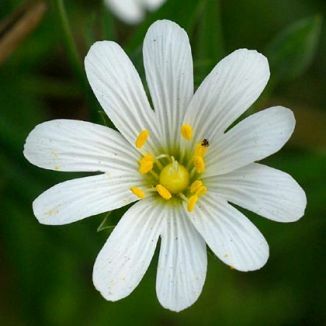 Greater Stitchwort is not easily confused with other wild plants on this web site. Along the roadsides and laneways of rural Ireland, from April to June, this perennial scrambles and straggles its way over other vegetation and banks, putting up a great display. Its snow-white flowers, 15-20mm across, have 5 deeply cleft petals and are borne in cymes of 7-11 on rough-edged stems from April to June. The sepals are only half as long as the petals. The leaves are narrow, unstalked and grass like. This is a native plant and belongs to the family Caryophyllaceae. I first identified this flower in Roundwood, Co Wicklow in 1976 and photographed it near Ballymitty, Co Wexford in 2005. Perhaps it is for its pure whiteness that this plant is known in France as 'Herbe à la sainte-Vierge'. 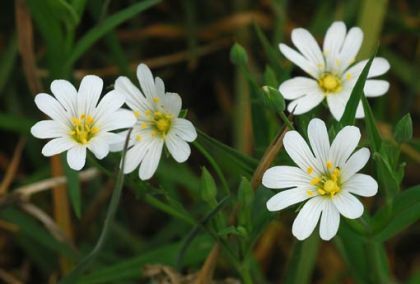 Greater stitchwort was valued as a cure for "stitches and pains in the side" in many parts of Europe.